Venezuela's currency continues to collapse. Just in November, the bolivar has lost 55% of its value. It's the latest sign of Venezuela's extreme economic, political and humanitarian crisis. Sky high food prices -- or massive shortages of basic food and medicine -- have plagued Venezuelans for years and have gotten worse this year. 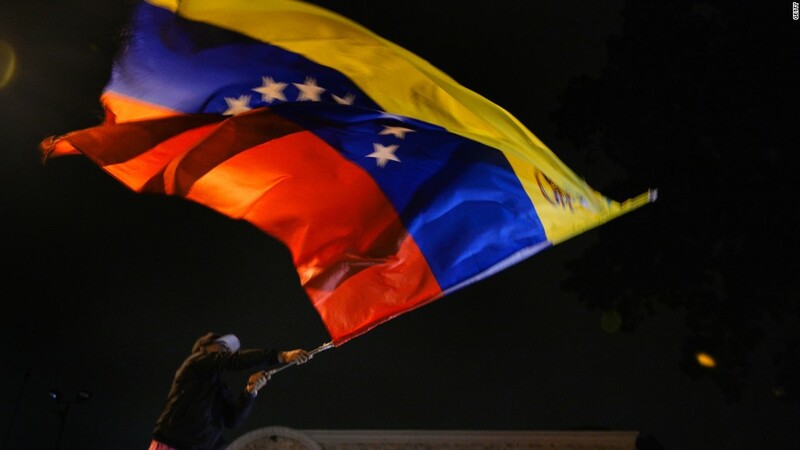 Inflation in Venezuela is expected to rise 1,660% next year, according to the IMF. The country has been in recession for three years now. One dollar fetched 1,567 bolivars on November 1. 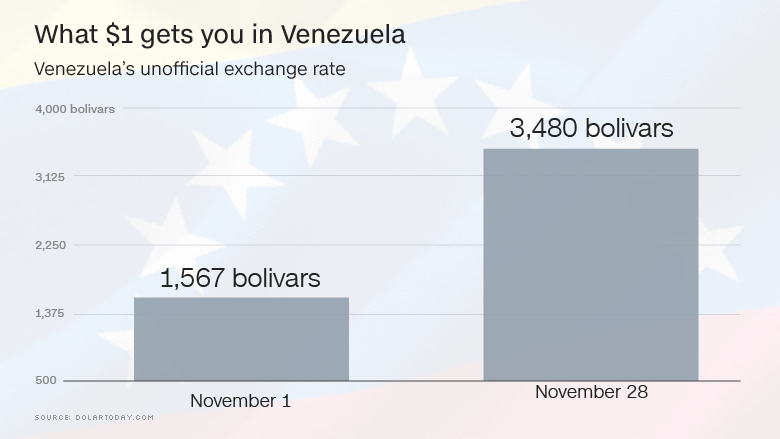 On November 28, a dollar was worth 3,480 bolivars on the widely-used unofficial exchange rate monitored by Dolartoday.com. "It's a currency that's going down the toilet," says Russ Dallen, managing partner at Caracas Capital Markets, an investing firm in Miami. "No one wants to hold on to something that's going to be worth 50% less in a month." A few factors are behind the bolivar's most recent plunge. The government has been forced to pump cash into its system because the money in circulation isn't enough to pay for goods that cost a lot more. Over the summer, the government was increasing the number of bolivars by 100% a month. But since then, the rate has accelerated: by mid-November, the amount of bolivars in circulation had increased by 130% compared to a year ago, according to central bank statistics. But with the value of the bolivar falling so dramatically, Venezuelans are desperately trying to exchange their bolivars for dollars, which is seen as a more a more valuable and stable currency. That's led to a scarcity of dollars. That's boosted the dollar's value versus the bolivar even more. Here's what else is behind the bolivar's blight. 1. Food prices have skyrocketed this fall as the government stopped enforcing some price controls following a food scarcity. Many vendors had stopped selling food because the price controls was forcing them to sell at a loss. Now, with the price controls gone, there's food available on supermarket shelves, but at such exorbitant prices that few Venezuelans can afford. 2. The government recently increased the minimum wage by 40%. 3. Venezuela fully reopened its border with Colombia earlier this summer, allowing Venezuelans to go and exchange money to buy basic food and medicine. That drove up demand for dollars and more bolivars disappeared from circulation. 4. Finally, the government cut the cash requirements at banks in Venezuela, which also helped juice the number of bolivars in circulation. The government badly needs cash as oil prices remain low and it scrambles to make debt payments. Venezuela is currently behind on one small debt payment and could officially default in mid-December. Oil is Venezuela's only major source of revenue. Against this backdrop, there's no end in sight for Venezuela's cash crisis. "It's absolutely a worthless currency," says Siobhan Morden, head of Latin America fixed income strategy at Nomura Holdings. "1,000 to 2,000 to 3,000 -- it's just crazy. It's in free fall."